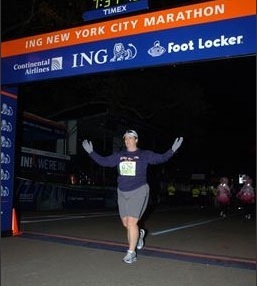 This is me crossing the finish line at the 2010 NYC Marathon. I am so happy that you can't see that I was crying when I crossed the finish line. I’m back! Remember when I wrote you last year and asked you to take care of me? I am happy to say that you did indeed do everything I asked of you. So, for this year can you please do it again? To be honest, there was a time when I didn’t think you and I would see each other again this year. I had a hard time getting excited to run, let along running for you. My thoughts shifted from deferring you for another year and just running you to get it over with and be done with marathons for a long time, if not forever. But something happened along the way, you gave me what I needed, exactly when I needed it. How do you do that? During one of my long runs, it may have been 13 or 14 miles, I’m not sure but I wasn’t even at the half way point yet and struggling. While questioning my commitment to you, you showed me two runners going along at the pace I was supposed to be running. That was my turning point. After that I had two more really good long runs and I got excited about you, there was no more talk of deferring. Thank you. Once again, you showed me hidden treasures of this city that I had long forgotten about. You reminded about why I love this city. Thank you. You let me figure out solutions to problems, come up with new ideas, listen to a song on repeat over and over again, and let me think and remember people I had lost who motivate me at my toughest moments. Thank you. I learned some new things about those water fountains along the Hudson River. Who knew there was a delay so that the water doesn’t freeze. Still not sure about the water fountains near W. 13th and their over eagerness to spew water. I’m not complaining, that felt really great on hot August days. I found my running mojo again and ran these long runs better than last year and now I look forward to running my marathon better than last year. You can barely see these women, but they are wearing tutus and other pink things all over their bodies. 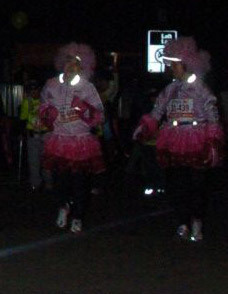 I beat them and I hope to beat more pink tutu wearing ladies again this year. Last year, I told you that I would finish you even if I was crying, crawling, or being dragged. I cried, the crawling happened later that night when I got into my bed. This year, I am going to finish you again and maybe I’ll cry or maybe I won’t. But I will cross your finish line again, hopefully in less time that it took me last year. But can I ask you one favor? Please keep the people dressed as Yankee/Mets players, Rocky and Bullwinkle (and their third friend that I know was there, because I was NOT hallucinating), and any ladies wearing pink tutus away from me. This entry was posted in NYC Marathon, running and tagged mets, nyc, NYC Marathon, NYRR, pink, rocky and bullwinkle, Running, Tutus, water, waterf fountains, yankees. Bookmark the permalink. I’ll be volunteering at the Mile 25 aid station this year. If you want, let me know on Twitter your bib no. & what time you think you’ll be finishing & I’ll cheer if I see you. Good luck!